Sesame (Sesamum indicum L) seed yield is not enough as other oil crops due to lack of sufficient knowledge on management practices in Bangladesh. The tactic as foliar application of auxin: 1-Napthalene Acetic Acid (NAA) which promotes the yield. In a recent paper by author Md. AbubakarSiddik, the increase of sesame yield was obtained with plant bio-regulator, NAAother than the traditional system. Such increased was demonstrated through NAA and noticeably highlights the potential asimmediate time demanding solution in relation to use of fertilizer. “The use of 1-Napthalene Acetic Acid at the rate of 50 ppm as foliar spray during vegetative and pre flowering stage improvesmorpho-physiology, yield contributing characteristics and yield of sesame that can contribute to fulfill the demand of sesame seed along with inspiring the farmers to cultivate sesame with less use of inorganic fertizers and low cost. The author conducted the research for the partial fulfillment of his MS degree to improve the seed yield of sesame using variety BARI Til 4 with different levels of 1-Napthalene Acetic Acid at Sher-e-Bangla Agricultural University, Dhaka. In the paper, M. A. Siddik shows how NAA progress morphological characteristics of sesame including: plant height, number of leaf and branch plant-1and with physiological attributes such as: shoot fresh and dry weight, root fresh and dry weight. The yield contributing characters and yield of sesame: number of pod plant-1, pod length and diameter, seed weight plant-1 and plot-1, 1000 seed weight and yield were improved by altering of morpho-physiological characteristics with NAA. 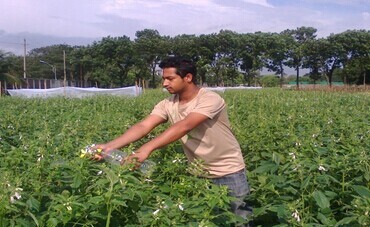 In this way, foliar application or spraying of NAA will increase the yield of sesame not only in Bangladesh but also in the world. M. A. Siddik goes on to suggest that “ as a developing country and there is gradual decreasing trend of agricultural land along withlack of information of management practices to grow sesame in Bangladesh, therefore this research was done to create a new way to boost up the yield with plant Bio-regulators, NAA that is friendly to environment .